The explosion of Internet technologies and lightning-fast global networks has fundamentally changed the way we communicate. Companies of all sizes around the world, have embraced video collaboration as an efficient, more cost-effective alternative to in-person meetings–and for good reason. Businesses using video conferencing as an alternative to face-to-face collaboration can expect to reduce travel expenses by as much as 30%, leading more than half of enterprise executives to consider investing in the technology in the coming years. When you factor in the lift in productivity and an increasingly mobile workforce, it’s easy to see why video collaboration is expected to grow nearly 20% in the coming years. However, with so many video collaboration options available, it can be difficult for prospective buyers to determine the right fit for their business. Video conferencing platforms have evolved to be more agile and scalable, providing unprecedented flexibility that shatters the notion of one-size-fits-all technologies. Here are some key considerations to keep in mind when evaluating video conferencing for your business. As businesses expand into new markets and bring your own device (BYOD) environments create more remote workers, video conferencing will play an increasingly important role in connecting geographically dispersed teams. Email, chat, and teleconferences might be convenient for the occasional interaction, but only video conferencing can replicate the experience of in-person meetings for participants around the world. Video-based collaboration can reliably host hundreds–even thousands–of participants simultaneously, enabling them to engage with one another from anywhere, on any device via desktop sharing, whiteboarding, collaborative document management, and remote control of other computers on the call. More importantly, up to 90% of our communications are non-verbal, picked up from gestures and tone inflections. Video conferencing provides an immersive connection that brings a sense of inclusion to meetings and allows participants to actually see one another to pick up on subtle body language cues and facial expressions, dramatically improving engagement and reducing the likelihood of miscommunications or misunderstandings. For big. For small. For all. While large and small companies may have vastly different business needs or objectives, both can benefit greatly from video conferencing. Larger organizations–with multiple offices, hundreds or thousands of employees, and globally dispersed customers–can use video conferencing to bridge time zones and geographical boundaries. In fact, 87% of companies using video collaboration say it helps expedite decision making, regardless of where their colleagues and counterparts are located. Small firms also benefit from video conferencing, albeit in slightly different ways. 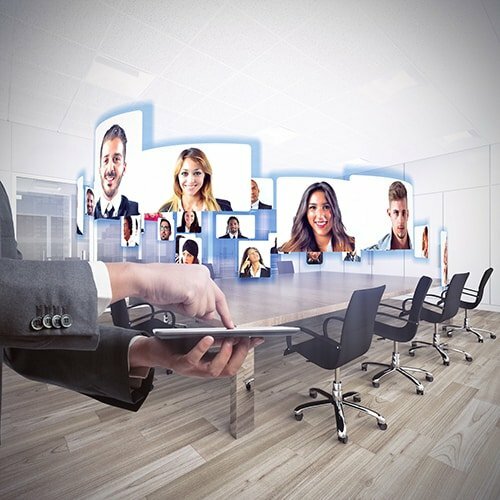 While smaller companies don’t have nearly the manpower to cover large swaths of territory as their larger counterparts, video conferencing helps to dramatically extend the reach of their businesses and interact live with customers and partners across the country or around the globe who might otherwise be unreachable by conventional meeting methods. Better yet, video conferencing platforms are scalable to make the solution affordable to businesses of all sizes. Those with limited resources can take advantage of free versions for a handful of users and add features and user licenses as the need arises. At the top end, enterprises can leverage deep integrations with legacy hardware and enterprise applications for a complete, end-to-end collaboration solution without blowing their budget. Where your conferencing solution “lives” is a key factor for many business leaders. On-premise deployments give IT specialists more control over the communications environment, allowing them to “hug the boxes” and physically manage infrastructure, which is particularly helpful when incorporating video into a larger unified communications environment. However, on-prem deployments also mean you’ll be responsible for hardware maintenance, software upgrades, and end user troubleshooting–all of which may be too much work (and cost) for some businesses to bear. Alternatively, hosted conferencing solutions alleviate the burden of having to manage physical infrastructure, but at the expense of ceding control over some of your environment. Web-based conferencing as a service eliminates hardware purchases and maintenance, reducing a business’s obligation to simply purchasing enough licenses to cover their workforce, a much more palatable option for companies watching their spending. When you can’t meet face-to-face, video conferencing is the next best thing. Regardless of your company’s size, resources, or objectives, video conferencing platforms offer a range of features and functionality to help every business connect, interact, and engage more affordably and efficiently. What’s Your Unified Communications Plan Missing? Are you ready for a reliable partner? We’re here to help you strategize for the future. © On Call Holdings International, LLC | All Rights Reserved.